Before we get to specific recommendations and tips, a few things you should know about breakfast in Prague in general. First, if you’re planning to eat breakfast at a popular venue, make sure you have a reservation. We’re not saying Prague is the Portland of Central Europe, but the fact is that the lines can get crazy long. Want proof? Just take a look at the cold, blank stares of the people who have waited in vain for two hours just to get a table at Café Savoy on a Sunday morning. Finally, coffee in Prague is seriously and surprisingly good, and while not every place that serves great breakfast serves great coffee, and vice versa, the overlap of the two has been growing steadily in the past few years. Therefore, if you think breakfast is incomplete without a cup of great coffee (and we're on the same boat), Prague will treat you well. Suffice to say that Café Savoy has replaced Cestr as the restaurant we visit after a long trip abroad to recalibrate our tastebuds to Prague’s cuisine. Open for breakfast, lunch and dinner, the Savoy is hardly a hidden gem: it is listed in every guidebook, but very popular with locals, too. The latter actually make reservations, so don’t bother coming for Sunday brunch without one. Eating Sunday brunch at Café Savoy is… a business class experience. You have done well in life, and you get to share breakfast with the other chosen ones. Yes, sir, we have your newspaper. Yes, you can have an all-whites omelette, mam. (Prepare to pay business class prices, too, but this is not a place to act cheap.) While they have the instruction not to say no to any request, the staff may feel rushed at times. Forgive them: they have ten other tables to wait, and they also do really long shifts. Anyway, this is how you do breakfast at Café Savoy right: (1) order a glass of Champagne, (2) inspect the pastry station by the restrooms downstairs, (3) order either any of their breakfast sets, egg dishes, the French toast, or the brioche toast with ham, poached egg and melted cheese, (4) get something sweet to finish: either a vetrnik, or croissant with their jams made in-house. Not everything is ideal on Planet Savoy: the coffee got really much better but still isn’t given the time or care of the very best in town. Also, the consistency of their 5-minute eggs can be all over the place. But hey, nobody’s perfect. The biggest question when it comes to the Bottega bistros is which one of the five locations you choose. Our favorite is Bottega Linka in the New Town: the interiors are stunning, and EMA Espresso Bar is just around the corner if you crave specialty coffee before or after breakfast. We just sit in the beautiful window box (ask for it when you make your reservation), get both of their set menus and we’re happy campers. While the locations may be slightly different, they all share some core values: high quality Italian produce, great modern interior design, nice salad bars and some clever cooking. Wines are also served by glass and bottle, so extending your breakfast into lunch is an option, too. Where the Bottegas really shine is the consistency of their cooking: this is a no-fuss place where you can just go, make your order, and 99% of the time it will be good. If we were to complain about anything, it’d be the coffee and the pastries. We’re just not fans. Go to Bottega Gastronomica for outdoor seating, Bottega Bistroteka and Bottega di Finestra for easy access to the main sights, and Bottega Tusarova for a neighborhood feel. Meeting friends and getting some grub on a Saturday farmers market is actually one of our favorite activities, period. Our most favorite market, the Naplavka on Prague's riverside, offers fantastic coffee from BrewBar, hot meals, and more kolachees, donuts and cakes than anyone in their right mind could handle. And eating breakfast al fresco is good for you. Gwyneth Paltrow would approve. The other farmers markets in Prague offer good breakfast options too, from the burgers, galettes and Raclette sandwiches at the Dejvice market to the kolachees and sausages at the Jirak market. And good coffee can be had in all of these stops, so they’ve got that covered, too. But that’s all beside the point: breakfast at a farmers market is more about the experience than the food: you get to watch relaxed Prague locals just meeting friends, enjoying the weekend and leaving stress at home. Two disclaimers: (1) Please bear in mind Prague’s latitude. (Think Northern Ontario, Canada.) Don’t expect a bounty of fresh produce outside of the growing season. That’s where the cooked meals step in. (2) The Saturday markets are very popular and can get very crowded. Get up early and get there around 9am to beat the crowds. Want to enjoy breakfast without tourists, among the locals and with a nice neighborhood feel? You might want to consider Café Jen. Started by two college classmates, Domca and Hanka, the all-female staff (!) who clearly like each other (the staff members bought a vacation trip to the owners so that they can get out of town and live a little - how cool is that?) can create a really pleasant, welcoming atmosphere that you’ll want to experience again and again. And Domca and Hanka have remained hands-on and a constant presence even when Café Jen became a successful staple: Hanka was a finalist of last year’s Czech Barista Championship, and the food is honest and never seems to skimp on anything important, or take cheap shortcuts. The breakfasts are wholesome, rich and fun, and… wait for it… served all day. No questions asked. And where others may have a problem with consistency, Café Jen has always delivered. We guess that’s what happens when a business has a real owner and a face behind it. Oh wait. Make it two faces. Kamil, the owner of Café Lounge and its sisters (EMA Espresso Bar and Alf&Bet) has always been good at networking and lucky with his hires, and that’s why Cafe Lounge manages to pull off a difficult feat by offering nearly everything at really good quality: baristas serve specialty coffee and teas sourced by the wizards of Tea Mountain. The sommeliers offer interesting natural wines, including some Champagnes and Cremants du Jura. The pastry chef (and a blogger known under her alias Chez Lucie) makes killer kolache, buns and pancakes. And while the breakfast offerings were sometimes hit-and-miss, the arrival of Michal Cerny, former chef/owner at the popular Story restaurant, shows lots of promise on the food front, too. Tucked away in a small street, this smaller cafe with Belle-Epoque visuals has the feel of a hidden gem. (It is not, especially among the locals). Get an outdoor seating in their beautiful backyard in the summer. When the Ambiente group reopened Mysak last year, it had big shoes to fill, occupying an iconic space that bore the same name since 1911, and was legendary even under Communist rule. The menu tries to connect to the tradition of the First Republic with the pastries and ice-cream sundaes, but the breakfasts - served all day - add a modern touch to the classics: the ”Vodickova” breakfast gives the Eggs Benedict a local makeover and uses modern techniques to perfect the sweet buchty buns in a killer rum & vanilla sauce. Add a focus on specialty coffee and rich pastries from Cafe Savoy, Mysak’s sister operation, and even the haters (“This is BS! I used to eat here for two crowns back in 1974!”) will be happy. Compared to Café Savoy, Mysák is much less touristy, at least for now, but the space is slightly less comfortable: while Cafe Savoy feels of a worn glove, Mysak, half a year later, still has a bit of that new car smell. Nevertheless, it has become massively popular among locals willing to pay top dollar for quality. We’ve always been fans of Proti Proudu, a small independent bistro in the Karlin district opened by Karolína, the author of a fairly popular cookbook, and her husband, who simply made their dream come true by opening a small bistro. What really kept us from visiting more frequently was the coffee they serve. That said, you have to like the design of the place, which is airy, generous with lots of natural light. And the food is what you expect from honest home cooking. The breakfast offerings are also nice, with one standout item: the waffles. Okay, we admit it: we like our breakfasts (and most foods) messy and a bit naughty, and the waffles are both at the very same time. Some serious break-up food there. But all the egg dishes are nicely prepared, too, and you can stop for coffee at Muj salek kavy just a three-minute walk away. Proti proudu is a great place to stop if you like your breakfast in a relaxed environment that, due to the layout of the tables, never seems too crowded. Age is nothing but a number, and you can prove that to yourself by meeting two conditions: (1) you’re over 30, (2) you have brunch at The Tavern. No, really, The Tavern is your place to go if you crave “proper” brunch. We’re talking friend chicken biscuits with bacon on Saturdays, or chicken and waffles on Sundays (the only two days of the week when The Tavern serves brunch), cheeseburgers or ”Zizkov hangover fries” (you don’t wanna know). 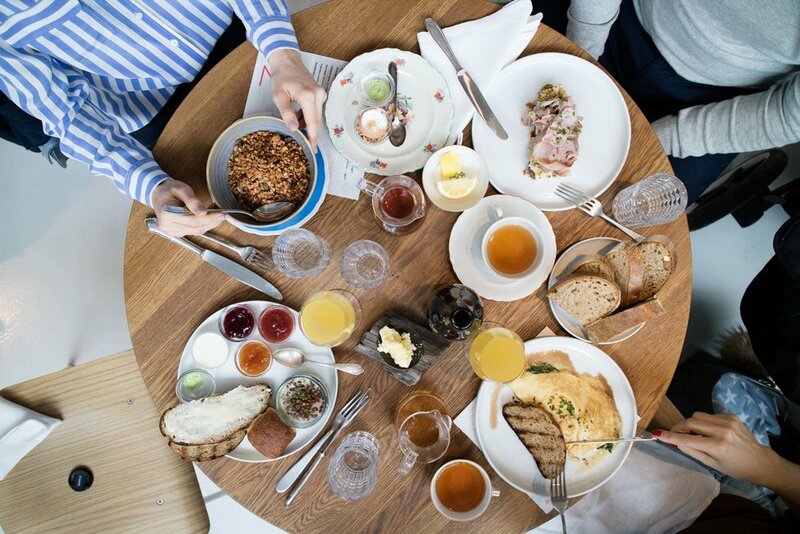 Add mimosas, bloody marys or sours, and one of the best soundtracks in town, and you’re in brunch heaven. Fatty, boozy heaven. Nothing wrong with that. If you think your digestive system may not handle The Tavern’s brunch with dignity, you may want to consider Mezi srnky. The self-proclaimed “breakfast and brunch restaurant” seems to have broken the curse of the premises in the Sazavska street that broke the back of many previous owners. First, the rooms is entirely remodelled, and it feels like eating in a kitchen because, ahem, you are literally eating in the kitchen. With just two longer tables and window seats, this is as small as it gets, which means the atmosphere is very personal and familiar. The food is comforting, colourful and vegetable-forward and feels “home-made”. Mezi srnky is also one of the few places in Prague that serves breakfasts suitable for vegetarians and vegans, and that’s not a bad thing. Add solid coffee, and Mezi srnky might be a place you find yourself visiting the Vinohrady district for. With a small footprint of a bistro that focuses on modern itinerations of the chlebicek, the classic Czech open-faced sandwich, Sisters is not a place where you’ll spend hours having breakfast, sipping mimosas and watch people walk by. Sisters is not that comfortable and generous when it comes to space. But for a quick breakfast before travel or exploration of the Old Town, Sisters at the beginning of the Dlouha street is a pretty solid choice. The menu is concise but focused - eggs benedict with airy hollandaise, and a few toasted loupaky, the Czech answer to the brioche bun, with fresh and tasty fillings. Also, what’s wrong with having open-faced sandwiches for breakfast? Exactly. Skip coffee and go to onesip coffee behind the corner for one of the best cups of coffee Prague has to offer. Sure, you won’t get eggs at Praktika. And you won’t get English breakfast or sausages or pancakes. But if your idea of a great breakfast is great bread with nice toppings and good coffee and not much else, Praktika bakery will deliver on all of these fronts. And with bread that good, why spoil it with anything more than a hearty pate or butter and jam? That’s really all you need, and that’s really all you get. And with just a few tables, eating at Praktika could not get any more personal, as the owner and baker Tomas explains the flours and explains the processes. (And no, you probably won’t understand half of it.) Need more? Finish yourself off with cronuts at Oh Deer! bakery next door. Home Kitchen has great interiors (they must own a forest because all the locations are pretty much all timber, all the time) and nice breakfast sets but the problem is inconsistent output of a very conservatively run kitchen, and sometimes the service. Pastacaffé can serve some really nice breakfasts, with some nice lighter options, but we’ve had some colossal misses, and the patrons at the outdoor tables in the Vezenska location can be ”too Kardashian” for our taste sometimes. We really prefer the Vodickova location in the New Town. EMA Espresso Bar sells great coffee but their toasts and baked sweet buns can easily pass for a quick and handy breakfast. Heck, we've been there many a time. Wine Food Market should be a winner on paper, making full use of the incredibly well-stocked Italian shop and the kitchens, but we’ve never really had breakfast there without some kind of annyoance, either on the plate or in the interaction with the staff. Las Adelitas at Lucemburska sometimes serve Mexican-styled breakfasts. Café Letka’s breakfasts are okay, but we keep coming back for the interiors. Eating breakfast at Bar Cobra will make you feel cooler than you really are. And breakfast at Bistro 8 gets points for creativity and ambition, although it may be let down by execution sometimes. Finally, the Sunday film brunches at Kino Aero and Bio Oko, two of our favorite independent cinemas in Prague, will please the film buffs. Wanna treat yo'self? (You know you deserve it.) Fancy a classy brunch in fancy classy surroundings? 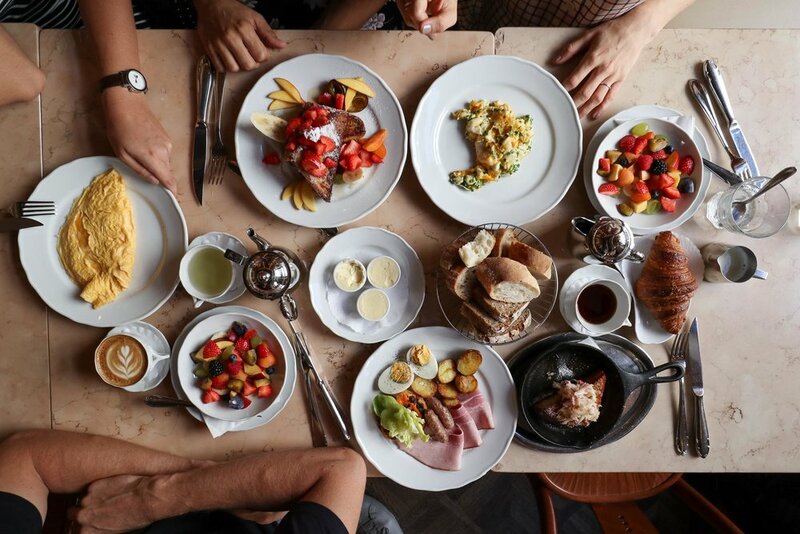 The brunch at La Rotonde should be on your list. There's a reason why the Czechs have been liking their best meals to the cooking at Alcron, and La Rotonde, a part of the Alcron hotel, will prove that to you. Special occasions only. On the opposite side of the price spectrum, the iconic Dejvicka nadrazka railway station pub near the Hradcanska subway stop opens at 9am. The cheapest beers in Prague, shots so inexpensive you want to inspect the bottle, and foot-long sausage for EUR 2. (Don't ask where they source the meat from. The best answer you're hoping for is "We don't know.") The best place for, ahem, "breakfast" at the end of a long night. And no, you won't get the references to the Communist-era TV host. Nobody does.